Environment pollution is the mixing of harmful pollutants into the environment causing disturbance to the natural processes and cycles. Various types of environmental pollution are categorized as the water pollution, air pollution, land pollution and noise pollution. Production of solid and liquid wastes on large scale from the industries, emissions of hazardous gases, deforestation, global warming and many more problems originated by the human beings are the main reasons of increasing the environmental pollution. In the last one decade, there is a great increase in the level of environmental pollution and scenario has become worse than earlier. In the whole universe, there is only one planet named earth provides facility of all basic elements required for the life existence. It gives us life and what we give it, pollution. However, it was much better that if we give it nothing but we give it pollution and contamination regularly. As we all live on this planet, we all are highly responsible for the maintenance of the earth. However, we all forget our responsibility and busy in our daily routine and competitions to just fulfil our needs in anyways. Fresh air and clean water are two most basic needs to sustain life but nothing of both is possible in the modern time. It seems that, after some decades here would be no man, no plants, no animals and no life. When the fresh air gets polluted by means of dust, toxic gases, smoke, motor vehicles, mills and factories etc. called air pollution. As we all know that fresh air is the most important element of the healthy life, we need to think that what happens if whole atmospheric air gets dirty. First of all air pollution is the matter of great regret for the whole human fraternity. Some of the big reasons of the air pollution are use of poisonous fertilizers, insecticides, pesticides in the agricultural sectors by the innocent farmers in order to increase the crop production. Released chemicals and hazardous gases (ammonia) from such fertilizers are getting mixed into the fresh air and causing air pollution. Burning of fossil fuels such as coal, petroleum including other factory combustibles are the major causes of air pollution. 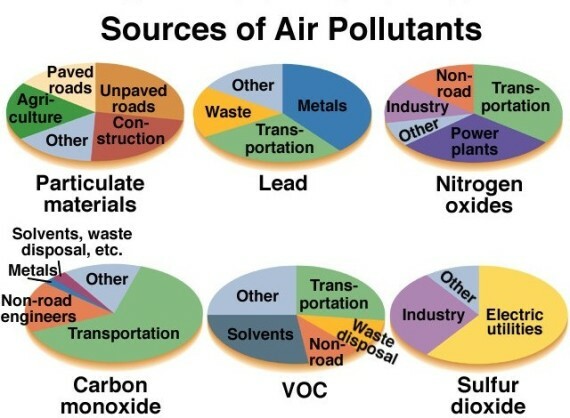 Variety of smoke emissions from the automobiles such as cars, buses, motorcycles, trucks, jeeps, trains, aeroplanes, etc are also causing air pollution. Increasing number of industries is causing release of toxic industrial smokes and harmful gases (like carbon monoxide, organic compounds, hydrocarbons, chemicals etc) in the environment. Some indoor activities of the people like innocent use of cleaning products, washing powders, paints etc emits various toxic chemicals to the air. The ever increasing level of air pollution also enhances its negative and harmful effects to the health of living beings. Air pollution is causing global warming to increase because of increasing atmospheric temperature due to the increasing level of green house gases. Such green house gases again causing green house effect and forcing sea levels to increase, glaciers to melt, weather to change, climate to change etc. 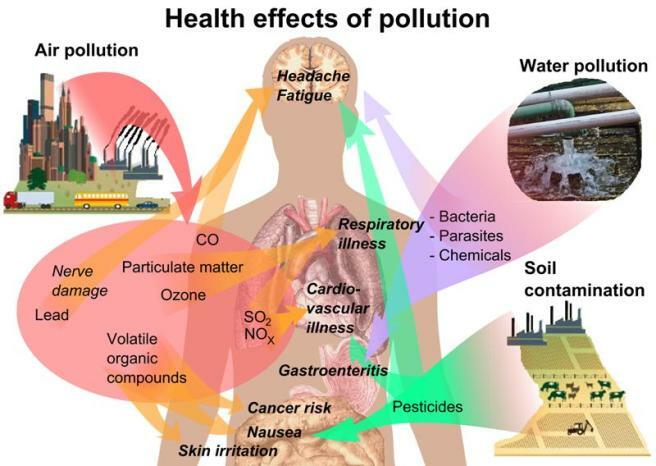 Increasing air pollution is causing many lethal diseases (cancer, heart attack, asthma, bronchitis, kidney diseases, etc.) and death to occur. Various important animals and plants species have been destroyed completely from this planet. Increasing level of harmful gases in the environment are causing the occurrence of acid rain and depleting the ozone layer. Contamination of water deteriorates the chemical, physical, and biological characteristics of the water which is very harmful to the human beings, animals and plants all over the world. Most of the important animals and plants species have been lost because of the water contamination. It is a global issue affecting the lives in both developed and developing countries. 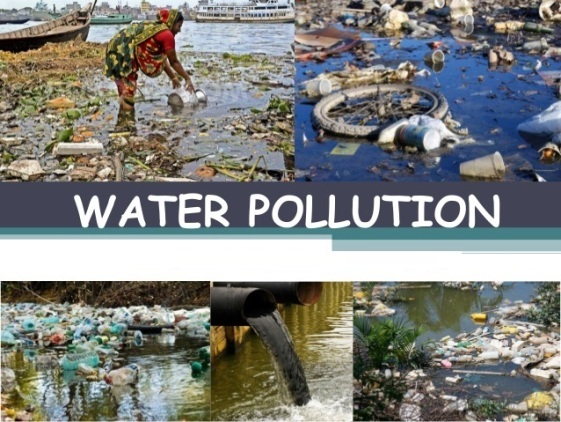 Whole water is getting polluted to a great level because mining, agriculture, fisheries, stockbreeding, various industries, urban human activities, urbanization, increasing number of manufacturing industries, domestic sewage etc. There are many sources of the water pollution (point source and nonpoint or diffused source) depending on the specificity of waste materials discharged from various sources. Point sources includes pipelines, ditches, sewers etc from industries, sewage treatment plants, landfills, hazardous waste sites, leakage from oil storage tanks which discharges wastes directly into the water bodies. Non-point sources includes excess fertilizers, herbicides and insecticides from agricultural lands and residential areas, oil, grease and toxic chemicals from urban runoff and energy production, Sediment from improperly managed construction sites, crop and forest lands, and eroding streambanks, salt from irrigation practices and acid drainage from abandoned mines, bacteria and nutrients from livestock, pet wastes and faulty septic systems, atmospheric deposition and hydro modification. Non-point source pollution contributes highly to the water pollution which is very difficult and expensive to control. All the fertile land on the earth is getting heavily polluted gradually day by day through the mixing of toxic materials released by the industries and domestic circles. Major sources of the soil pollution are industrial wastes, urban wastes, chemical pollutants, metallic pollutants, biological agents, radioactive pollutants, wrong agricultural practices, etc. Industrial wastes released by the industrial processes contain organic, inorganic and non-biodegradable materials which have ability to change physiochemical and biological characteristics of the soil. It totally disturbs the level of texture and mineral, bacterial and fungal colonies of the soil. Urban wastes are solid wastes include commercial and domestic wastes which make a huge heap on the soil and contribute to the soil pollution. Chemical pollutants and metallic pollutants are the industrial wastes from the textile, soap, dyes, synthetic, detergents, metal, and drugs industries which are dumping their hazardous wastes continuously in the soil and water. It directly affects the living organisms of the soil and reduces fertility level of soil. Biological agents (such as bacteria, algae, fungi, protozoan and microorganisms like nematodes, millipedes, earthworms, snail, etc) also disturb the physiochemical and biological atmosphere of soil and cause soil pollution. Some radioactive pollutants from the sources like nuclear reactors, explosions, hospitals, scientific laboratories, etc go very deep to the soil, remain there for long time and cause soil pollution. Wrong agricultural practices using advance agro-technology means use of huge quantities of toxic fertilizers including herbicides, weedicides, pesticides, etc enhances soil fertility however gradually declines the physiochemical and biological property of the soil. 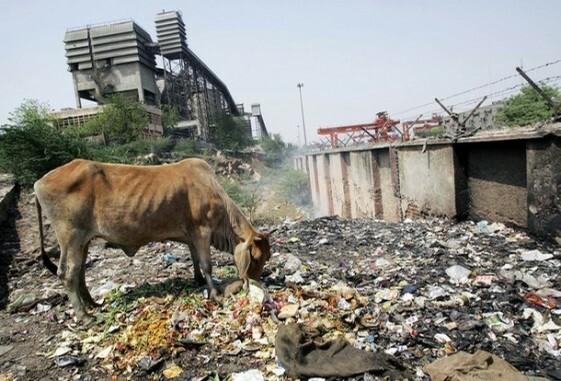 Other sources of the soil pollution are municipal garbage heap, food processing wastes, mining practices, and many more. Soil pollution is very hazardous to the health because toxic chemicals enter to the body through food chain and disturbs whole internal body system. In order to reduce and restrict the soil pollution, all the effective control measures including environment protection laws should be followed by the people especially industrialist. Recycling and reuse of the solid wastes and maximum possible tree plantation should be promoted among people. Noise pollution is caused by the noise when the level of noise gets increased than the normal level in the environment. 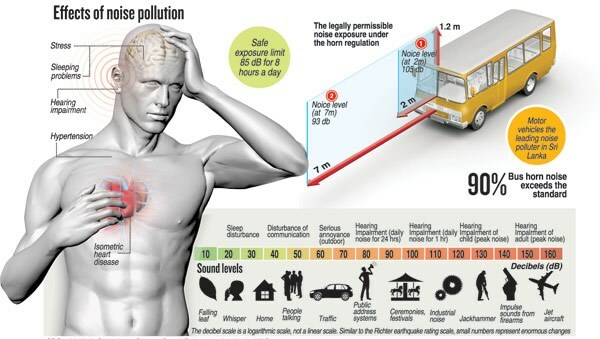 Excessive amount of noise in the environment is unsafe for the living purpose. Unpleasant sound causes various disturbances in the natural balance. High volume noises are unnatural and create difficulty in escaping those generated noises. In such a modern and technological world, where everything is possible through the electrical appliances at home or outside the home, the risk of noise has been increased to a great extent. · Industrialization is putting our health and life at risk because all the (big or small) industries are using big machines producing high pitch sound in large amount. Other equipments (compressors, generators, exhaust fans, grinding mills) used in the factories and industries also produces big noise. · Regular social events like marriages, parties, pub, club, disc or place of worship, temples, etc create nuisance in the residential area. · Increasing transportation in the cities (vehicles, aeroplanes, underground trains, etc) produces heavy noise. · Regular construction activities (including mining, bridges, building, dams, stations, roads, flyovers, etc) involve big equipments creating high level of noise. · Use of household appliances in our daily life is also the main reason noise pollution. · Noise pollution causes various hearing problems (damage to ear drums and loss of hearing) because of the unwanted sound. · It reduces ear sensitivity to the sounds required to regulate body rhythm. · It affects the psychological health and causes the occurrence of aggressive behaviour, sleep disturbance, stress, weakness, fatigue, hypertension, cardio-vascular diseases including other severe and chronic health issues in later life. · It creates communication problems and lead to misunderstanding. · Affects wildlife and makes pets more aggressive. General awareness should be increased among people and all the rules should be followed seriously by everyone in order to control the unsafe sound level in the environment. Unnecessary use of things generating high pitch sound should be reduced in the home or outside the home like clubs, parties, bars, discos, etc.